International Journal of Research in Health Sciences,2015,3,1,179-186. 1-Associate Professor of Pediatrics, 2-Assistant Professor of Medicine, 3-Associate Professor of Obstetrics and Gynecology, Govt. Medical College, Ananthapuramu, Andhra Pradesh, INDIA. Background: Hypertensive disorders in pregnancy (HDP) are the common cause of maternal, fetal and neonatal morbidity and mortality world over. Recent global estimates reported that their incidence is on decline, but in developing countries like India they rank second only to anemia. Objectives: Study the incidence of Hypertensive disorders in pregnancy and requirement of immediate postnatal resuscitation and outcome in babies born to these mothers. Materials and methods: Design: Cross sectional study. Setting: Tertiary care teaching hospital. 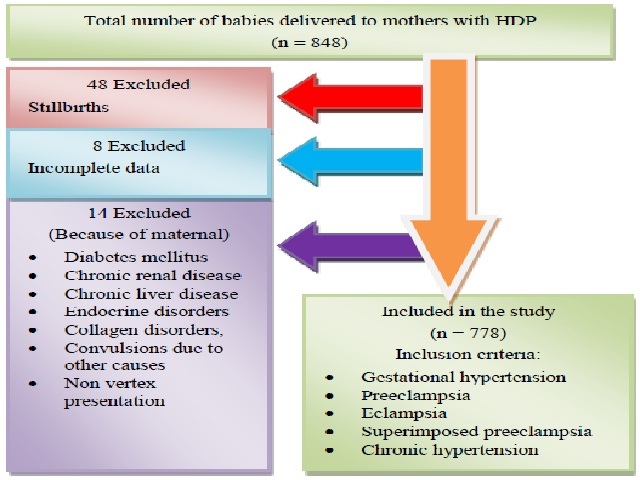 Patients and methods: 778 neonates with maternal history of hypertensive disorders in pregnancy formed the study group and equal numbers of babies born to normotensive mothers were taken as controls. Relevant maternal and neonatal data was recorded in a structured proforma. Number of neonates who required resuscitation were identified and resuscitated as per neonatal resuscitation protocol by American Heart Association. Type of resuscitation required and outcome in cases and controls was assessed in relation to maternal and neonatal risk factors. Results: Overall 75% cases required no resuscitation / basic resuscitation and 25% required advanced resuscitation while from control group only 7% required advanced resuscitation, 93% needed no or basic resuscitation. The difference was statistically significant (P=0.0004). Out of total 778 cases 84%babies survived and 16% died. Among controls 95% survived and only 5% died. Conclusions: In general 99% of babies can be saved with basic resuscitation even at peripheral health facility but babies of hypertensive mothers require more of advanced resuscitation and specialist services.